I think it's funny, really. well not the diet thing, but most everything else. I'm choosing not to like them, maybe I'm rebelling a bit?! if we haven't been having major dust storms. Ironing... I don't iron! I don't like to iron! so, I choose not to iron. For the safety of myself and my clothes! Cooking... that is a must have thing, right? I do like to cook, but not when it's in the 100's outside. That's when the crock pot comes in handy! Mending... sometimes, so this one really doesn't effect me. Baking... Yes, please! I LOVE to bake! I would BAKE all the time! someone says the word diet and I gain 5 pounds! Does that happen to any of you too? If so I did my chore for the day! Hi Amy! You definitely made me smile, so you can strike that chore off your list! So glad you are always home and taking care of your precious family! 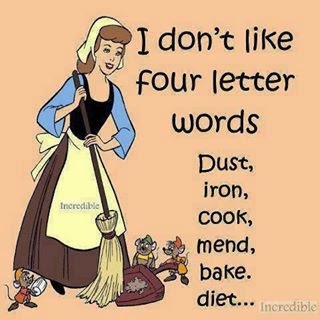 I am so with you, Amy - I love baking and prefer it over cooking :) And ironing...blah! Thankfully I only do it about once a month. Thanks for the smiles :) Hugs to you!